When I first saw Olympus’s wild new E-P1 camera, I froze. Because it looks just amazing. Brushed silver bodywork, a little patch of faux leather upon which to nestle your fingertips, an old-school flash hotshoe mount above the lens (no pop-up micro-flashes here which usually make a camera look like a Fitted 50:50 cap’s flipped up in a headwind), a proper round shutter release button, and another round button on the other side, chrome plate highlight lines… and a proper M-Zuiko lens stuck out the front. Just brilliant. Does retro get any better than this? The E-P1 blows my skirt up simply because I have this camera’s film ancestor—its great-grandpa, if you will. 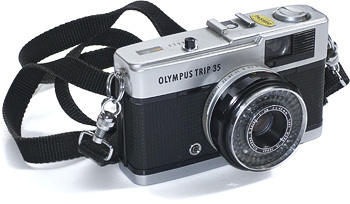 My Olympus Trip 35 was the first camera I owned myself; it was a birthday present so many moons ago I don’t care to even think about it, and I still cherish it today. It’s brutally simple to operate—no coin-sized batteries, no superfluous fanciness—just pop the film in and off you go. The Zuiko lens assures absolutely crisp images, as long as you have it in focus, of course, as the manual-focus lens clicks around to give you four options of focal points: one man, two men, several men, or a mountain. So once you have this figured out you’re good to go, zipping through film. (Best to use 400ASA black and white, for pro results.) This was the camera that was good enough for David Bailey to barge his way into a wedding photo shoot during that seminal British Olympus TV commercial back in the day, and I like to think of it as a beggar’s Leica. Cheap as chips. If you can, scour Ebay for one.